We had been to Waynad couple of years back, but didn't mind going there again. It was one of the few relatively quiet places, not crowded by tourists yet. There were quite a few attractions nearby, and one trip was definitely not enough to get our fill. 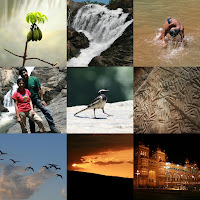 So we readily agreed for our second trip to Waynad. The maps and numerous printouts we had collected during our previous visit came handy in this trip. We started the trip stuffing the car with our tents and bags along with Gopi's three cameras (which he claims to love more than himself and they never left his sides through out the trip). For the first time in any trip I felt the space in my car not enough and wished I had a bigger car. It was a beautiful day, with clear sky, and a nice drive. We stopped for breakfast at the popular Kamath Lokaruchi on Mysore road. It appeared as if half of Bangalore was traveling out for the long weekend and had stopped at Kamath on their way out. Kamath was jam packed, but that didn't deter us from waiting patiently to taste the delicious dosa, idli and vada. While waiting we also made evil plans on how to get people eat faster and leave so that we can get a table. Finally the only plan that we had a chance of implementing partially was Leepsa's which involved standing near the table of a sweet couple sipping coffee and looking accusingly at them from time to time to make them feel guilty of making four of us stand. I think the plan worked, because we did get the table after few minutes. After having our fill of the yummy dosas, idlis and vadas, we hit the roads again. Our next stop was near a lake not very far from there, for photography. 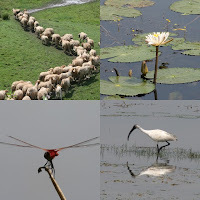 The sheep being herded by shepherds, the beautiful lotuses in the water and the birds feeding themselves in the lake was quite alluring for taking snaps. We hit the roads again quickly after taking snaps for some thirty minutes. We passed Mysore and took right on the ring road towards Kabini river. As the day got hotter, the road started getting from bad to worse. 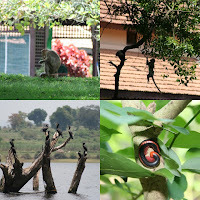 We finally managed to reach Kabini Jungle Lodges Resort. Gopi spoke to the resort manager and though we did not have any reservations, we were allowed to roam around the resort, take pictures and have lunch if we wished. We sat for sometime near the lake with the shutterbugs amongst us busy taking snaps. We also walked a short distance in the woods nearby looking for interesting subjects to shoot. We also saw a snake crossing the road and Gopi took a nice snap of it. We decided to have lunch there as all of us were hungry and the lunch looked sumptuous. Lunch was indeed good at 200 rupees per person. After the heavy lunch we started towards Meppadi. The car had become hot like an oven and we also lost our way in the maze of streets in the village outside JLR. To add to the misery the roads were horrible with big ditches. With the car fully loaded it was scraping the bottom over huge speed breakers, so people had to get out of the car couple of times to go over big bumps. We took the jungle route towards Meppadi (instead of the normal route) hoping to see some wild life. But as luck would have it, the road was very bad and seemed endless with no wild life. Fortunately it rained and matters cooled down a bit. We drove for around 4 hrs (for a road of 15 kms) in the rain to reach Meppadi. By the time we reached Meppadi, everyone was completely tired. While re-fueling the car, we realized that we forgot to withdraw cash before leaving Bangalore and cards are not accepted at all at Meppadi. We desperately needed to withdraw cash from some ATM and managed to do that in a Federal Bank ATM. The hotel that we had booked looked a bit shabby. While we were waiting in the car, Gopi & Ratish went ahead and checked out the rooms and completed the check in. We got a room in the 3rd floor which was 'supposed' to be a deluxe room (with torn window screens). To park the car we had to do a bit of hiking and finally managed to squeeze the car through narrow lanes to park it behind the hotel. Everything here closes down by 8:30 pm, so we freshened up a bit quickly and started for dinner at 7:30 pm. It was a small restaurant just beside the hotel but the food was awesome. We had soft Kerala parathas, egg curry, fish curry, biriyani and mango juice. The fish curry was really tasty - typical Kerala style, made with tamarind and Kerala spices. We decided to drop the idea of going for a walk after dinner since the roads were already very lonely. Back in the room, we called up couple of people in Kalpetta to arrange for the trek and camp on Chembra peak the next day. We were planning to trek half way through and put up tents for the night. Early morning we would have enjoyed the sunrise from those heights and climbed to the peak. Nothing concrete could be arranged as unfortunately the next day was a Sunday. We decided to try our luck the next day at Kalpetta and made a backup plan anyway, if we couldn't stay back on the mountains the next day, was to go to Edakkal Caves instead and splash in some waterfalls before coming back to Bangalore. We played cards for some time and watched the TV before going to bed early, looking forward for the next day. 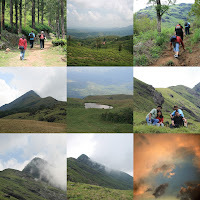 Next day, we got up at 6, since the plan was to start by 7 and reach Kalpetta by 8 to start the trek. But by the time all of us got together it was late and we reached Kalpetta only at 9. We spoke in the forest office there only to find out that they are not organizing any treks and no one is allowed to camp on the mountains. We just got permission to go up the peak and come back the same day. The path to Chembra peak is through a private estate. We had to drive through the estate to a bungalow, park our vehicles for a fee of Rs.20 and walk through the coffee estate for some distance till we hit the base of the mountain. There was a small watchtower at the base of the mountain from where the trekking path starts. By the time we started off from there, it was already around 11 in the morning. After the initial getting used to phase, we climbed at a steady pace till the lake. The area around the lake was pleasant and perfect for camping. The lake was heart shaped - nature's tribute to matters of heart. We went further up to the next level where there was a nice plain land where we took some rest and took some photographs. We could see the clouds hitting the Chembra peak and rolling over. The lake below looked like a jewel surrounded by the green grass. It was already 2:30 by that time and we had 2 more peaks to go before the highest Chembra peak. We quickly climbed up the first one. Leepsa decided not to continue further from there. So I stayed back with her while Gopi & Ratish went further. It was decided that once they come back, I can go to the top and then come back while they stay with Leepsa. We (Leepsa & me) relaxed there for some time and experimented with the camera. It was getting darker and still there was no sign of Gopi and Ratish. I knew I can go to the peak anymore, so Leepsa & myself started climbing back slowly. Mobile phones were working even at that place! So it was a relief to be able to talk to them. Once at the base, we washed ourselves in the refreshing cool water flowing in a stream and waited for them, while watching the sun set. Once back, we rushed back to Kalpetta to find some place to stay overnight. Most of the places were full, but found a small place after some searching to stay. Booked our rooms, went straight for dinner - similar spread of parathas and birianis. Once back in the room, had a nice clean bath and slept off. Gopi went on his night stroll. Next day morning was foggy and we tried to capture some moments in our camera from the roof top of the hotel. After that, had a good breakfast of idiappams and dosas, bought some fried jackfruit chips and started off for Edakkal caves. On the way we went to Soochipara falls, had a nice bath, took good snaps of birds and bees and of local lads frolicking in the water. After the nice bath we also had traditional Kerala meals with fish curry at a local restaurant and drove towards Edakkal caves, fighting sleep all the while. At Edakkal caves, we had to park our car at the foothills and take the jeep service up to the top at Rs.70 per jeep for a round trip. The road till the top has been cemented recently and the jeep just flew on those roads. From that place there is another short climb till the most popular cave with ancient cave drawings and writings. This is considered to be one of the earliest centers of human habitation, around 7000 years old. There are some inscriptions in a language similar to the ancient Pali language. After the tiring cave exploration, we had refreshing lime soda while waiting for the jeep to take us back. Back at the parking lot, we also had ice creams to beat the heat and started off in the direction of Bangalore. We did not see a single wild life while coming back through the Bandipur forest roads. But we quickly forgot the disappointment as we watched a spectacular sunset just after we entered Karnataka, still quite some distance from Mysore. At Mysore, the palace was lit up that day, it being Ugadi. We did visit the palace for a short time before rushing back to Bangalore.